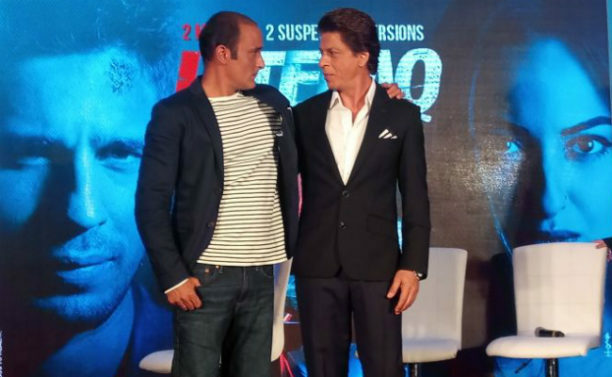 Yash Chopra’s 1969 cult classic Ittefaq, is one of Shah Rukh Khan’s favourite movies. In fact, he has always been keen on adapting the film and even acting in it. But, when SRK couldn’t do to it due to prior commitments, he decided to co-produce the suspense thriller with Karan Johar and Renu Ravi Chopra. King Khan is extremely happy with the way the upcoming movie has been directed by Abhay Chopra, and the person who has impressed Shah Rukh the most is Akshaye, who portrays the role of a tough cop. Ittefaq is produced by Red Chillies Entertainment, BR Studios and Dharma Productions and releases in cinemas this Friday 3rd November. Directed by Abhay Chopra, Ittefaq is the story of Dev (Akshaye Khanna), a police officer, who is investigating a double murder case that has only two witnesses, who are also the prime suspects. The suspects – Vikram (Siddharth Malhotra), an acclaimed writer, and Maya (Sonakshi Sinha), a young homemaker, have different narratives about the events of that fateful night. Both the stories seem true but there can be only one truth. Dev is torn between the two versions of the story, and will not settle till he finds out what happened that night.